The Finn has had a very good year – currently 4th on the drivers’ championship leaderboard just behind 4-time world champion Sebastian Vettel, Bottas has had high finishes nearly every race of the season, with points in all but two – Monaco and Hungary. Bottas is currently contracted to Williams, under whom he first entered Formula One as a test driver in the 2012 season. His contract expires at the end of the year, which makes him a free agent. Rumours have been rife that Bottas has not only spoken to officials at Ferrari, but signed a deal with them that is rumoured to be worth a whopping £13mn, said to have been negotiated by Bottas’ longtime manager, Didier Coton. Neither team nor manager confirmed anything at the time, but Italian autosport magazine Coriero del Sport reported on the deal earlier this month. If true, the deal will mean Bottas replaces his countryman, F1 legend Kimi Raikkonen, to partner Vettel. In addition, reports from the Hungaroring prior to the Hungarian Grand Prix suggested that commentator and former F1 driver Martin Brundle and fellow commentator David Croft had heard from Ferrari that “Bottas replacing Raikkonen is a ‘done deal’.” Although the two main parties involved have stayed quiet for the most part, persistent rumours from other sources indicate that this is, in fact, the case. 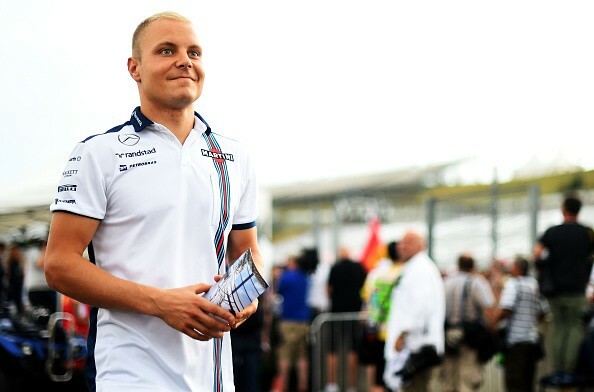 For his part, Bottas told the BBC he would prefer to focus on winning his first Grand Prix with Williams this year. Despite several strong races, the 25-year-old has had only one podium spot this year, at the Canadian Grand Prix, where he finished third. He acknowledged the power of dominant Mercedes, whose drivers Lewis Hamilton and Nico Rosberg currently sit atop the drivers’ standings, but mentioned that Ferrari had shown the Silver Arrows a significant challenge with 4-time World Champion Sebastian Vettel taking the win at the recently concluded Hungarian GP. Mercedes currently lead the constructors’ championships by over 150 points, with Lewis Hamilton leads the drivers’ standings, followed by teammate Nico Rosberg. If Bottas’ transfer is true, it has been strongly suggested that long-time McLaren driver and 2011 Champion Jenson Button is due to take his place, partnering Brazilian driver Felipe Massa, who was formerly with Ferrari himself.